Earlier today, Lisa Paxton, our Brainerd Lakes Chamber CEO, and Steve Mau, our incoming Chamber board chair and owner of Brainerd General Rental, shared an update on WJJY's Community Focus about their experiences in Washington, D.C., as part of the Voice of Minnesota Business Summit, which is being hosted in partnership with the U.S. Chamber of Commerce America’s Small Business Summit! This trip is a great opportunity for our Chamber to be able to share the collective voice of Brainerd Lakes Area businesses with our congressional delegation. Heavy rains this fall and large snow totals throughout the winter have combined to pose a serious flood threat to most portions of Minnesota. The threat is particularly serious along the Mississippi, St. Croix, and Minnesota rivers. In preparation for the upcoming spring thaw, we urge the public to review their flood insurance needs, including for businesses or commercial properties. It is important that you act now, as flood insurance policies are not activated until 30 days after the premium is paid in full. The best way to know if your business or commercial property is at risk for flooding this spring is by logging on to www.floodsmart.gov. By inputting your address into the easy-to-use One-Step Flood Risk Profile, you can find out if your business or commercial property is in a low, moderate, or high risk flood area based on the latest flood projections. The Flood Risk Profile will also estimate your annual premium cost and suggest local insurance agents serving your area. Your business or commercial property may be at risk of flooding. As much as 25 percent of all flood insurance claims occur in areas where business owners and residents never expected a flood to happen. Most commercial buildings in a moderate-to-low risk area qualify for coverage at a preferred rate. Preferred Risk Policy premiums are the lowest available through the National Flood Insurance Program (NFIP), offering coverage for your building and its contents at one low price. Premiums in these areas can start as low as $550 per year for both the building and its contents, while contents only coverage starts at $145 per year. Commercial coverage gives you up to $500,000 of insurance to protect your building and up to $500,000 to protect its contents. If your business is in a high-risk area, a standard rated policy is the only option for you. It offers separate building and contents coverage. If your commercial property is in a high-risk flood area and you have a mortgage from a federally regulated or insured lender, you are required to purchase a flood insurance policy. If you already have flood insurance for your business or commercial property, contact your insurance agent to discuss your policy and ensure you are prepared for any possible flooding. Then, take a photo inventory of your building and its contents to properly document your assets. This will save you time and headaches after a flood. If you do not have flood insurance, visit www.floodsmart.gov and use the One-Step Flood Risk Profile to determine the threat of flooding in your area and identify local insurance agents who can help you purchase flood coverage. The spring thaw is approaching quickly. It is important to act now, and take the easy affordable preventive measures to avoid devastating losses in the upcoming flood season. It may be better to have an affordable flood policy now than pay hundreds of thousands of dollars in damages after it is too late. Minnesota Department of Commerce staff are on-hand and available to answer any questions you have regarding flood insurance. Please call our consumer helpline with any questions or concerns you have. You can also find more information about residential and commercial flood insurance on our website at www.commerce.state.mn.us, or call our consumer help line with any questions at (651) 296-2488. Thank you for your attention to this important alert. Working together we can help protect businesses from the very serious threat of flooding facing Minnesota communities in the coming months. The Brainerd Lakes Area Chamber has taken on a bit of an international flair over the past several months. Thanks in part to an international scholarship program combined with a tremendous working relationship with Central Lakes College; two aspiring business majors are making connections through the Chamber’s Member Outreach Committee. Bradley Van Der Zandt, 22, of Cape Town, South Africa; and Jaka Mahendra, 23, of Probolinggo, East Java, Indonesia; have been in the Lakes Area since August 2010 as part of the US Department of State’s Comm unity College International Development program, a program aimed at providing opportunities for building global relationships that strengthen educational programs and promote economic development. Both young men were chosen to come to the United States on a scholarship to attend a community college and serve an internship in their respective communities in relation to leadership. Bradley and Jaka are two of nine CCID students currently residing in the Lakes Area and attending Central Lakes College. Although unfamiliar to each other prior to August, both men shared a common interest in business. After arriving in Brainerd and visiting with CLC advisors, both men were encouraged to connect with the Chamber to learn more about local business relationships, leadership and opportunities. Jeri Hughes, Events Coordinator with the Chamber, said she was contacted by Joan Jenkins and Pat Swarthout from CLC in regard to the students and their interest in getting involved locally. Hughes said the Chamber was more than eager to take the students on through an internship. Both Bradley and Jaka attend monthly Chamber committee meetings and networking events where they have an opportunity to network and learn, first hand, how local businesses operate. Both men are already well on their way to reaching their business aspirations. Bradley received his business management degree in Cape Town before coming to the US, and has a strong interest in pursuing work in financial management; while Jaka has already owned his own business, an Internet café, back in Probolinggo and hopes to reopen his shop when returning home this year. 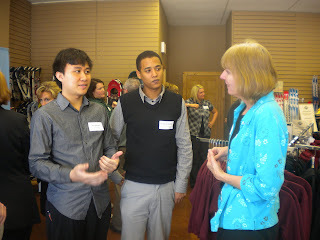 In addition to attending meetings and learning through making observations, both men also attend the Chamber’s CHOW events to meet and greet and assist wherever necessary, as well as make personal calls to Chamber members to invite them to events and thank them for their participation in past events. “We’ve really focused a lot on networking because that was their interest,” Hughes noted, adding how impressed she has been at their willingness and ability to jump in with both feet and get involved in such new territory. Shannon Janco, Chamber Member and Chair of the Outreach Committee, said she has enjoyed getting to know both men through her Chamber involvement and believes other members would most definitely agree. The two men will return to their respective countries in May, but not before taking a trip to visit the Nation’s capitol, as well as New York. “I’ve enjoyed the college,” Jaka said, noting the friendships and connections he has made in such a short amount of time, including an experience that made local news. In November, Jaka and fiancée Anindita Anjali, who lives back in Indonesia, were married over the Internet via Skype software. “We are here to study and get exposure to being American students,” Bradley explained. Part of that exposure has included an introduction to snow and cold, something both men agree was enjoyable for one day but quickly grew old. They also laughed about their fondness to American fast food, something they admitted to walking late at night in the cold to get from their apartment at The Pines near CLC. “The people have been just so friendly since the time we got here,” Bradley noted. Officials of Crow Wing and Todd Counties today unveiled the innovative results of a pilot project aimed at delivering superior county services to customers in a cost-effective manner. The results of the pilot study were revealed today during a news conference at the Staples City Hall before an audience of employees and elected officials of Crow Wing and Todd Counties as well as representatives of the Minnesota Chamber of Commerce, Brainerd Lakes Chamber, Long Prairie Chamber of Commerce, Staples-Motley Area Chamber of Commerce, Initiative Foundation and Region Five Development Commission among others. Through a collaborative process over the past five months, the partners in this project intensely studied how to better serve customers receiving community services, especially those receiving multiple health and human services. The partners wanted to determine how counties can better serve their customers, in a respectful manner that leads them to self-sufficiency, through judicious use of taxpayer dollars. Tim Reardon, of The Reardon Group, said this study affirmed the need for prevention and early intervention so that the need for more intensive and expensive interventions can be avoided. • Investing the right resources at the right intensity at the right time for the greatest impact. • Giving discretion for care to the people who know the customer best. In a sense, empowering front-line workers with the ability to tailor services based on needs. • Providing the necessary resources to meet customer needs. • Improving communication and services, especially across program areas, in part through better use of technology. • Identifying rules and regulations that are barriers to change. Social services administrators in Crow Wing and Todd Counties intend to immediately implement changes in policy in their counties as a result of this study. Other changes will require legislative approval. The counties, together with the Minnesota Chamber of Commerce as well as regional chambers of commerce, will help carry this message to Minnesota legislators. Early in this study, the partners placed a high priority on consulting groups of people through focus groups. Customers provided enlightening information about their experiences. County workers and contracted service providers gave their input and observations about the current system and how it could be improved. In addition, county officials researched data in their respective counties to understand patterns and how multiple services were delivered to customers. Service areas studied included corrections, law enforcement, public health and social services. This information was then analyzed by a team, a Design Lab, which used the information to formalize recommendations on how to improve the delivery of these county services to customers. During the annual Explore Minnesota Tourism Conference, several organizations, businesses and individuals were recognized for their contributions to the state’s travel industry. 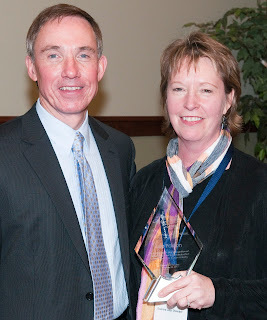 John Edman, Director of Explore Minnesota Tourism, was pleased to announce Lisa Paxton, chief executive officer of the Brainerd Lakes Chamber, as the “Outstanding Individual in Tourism” for her long-term work on behalf of the Minnesota tourism industry at the community, regional and state levels. Paxton has served on the Explore Minnesota Tourism Council since 2004 and currently is the chair of the council's public policy committee. She has also served as president of the Minnesota Chamber of Commerce Executives. Paxton was also a catalyst for the unique public/private partnership that developed the Highway 371 Welcome Center and was recognized for her experience in several tourism positions in the Brainerd area. Chamber Board Director Tom Kavanaugh, of Kavanaughs Resort, said, "Lisa has been a great asset to tourism throughout the Brainerd Lakes area and has worked very hard in assisting our industry at the state level and working with Explore Minnesota Tourism on issues that affect tourism throughout the state. It is, and has been a pleasure working with Lisa on tourism issues and I have always found her to be someone that gets things done and understands how critical tourism is to our area and the state's well being"
The Lodge on Lake Detroit received a “Sustainable Tourism Award” in recognition of their environmentally friendly practices. Awards are also given annually to note creative, successful tourism marketing programs by Minnesota communities. Recipients of this year’s Travel Marketing Awards of Excellence included the Ely Chamber of Commerce and Visit Duluth. Marketing Awards of Merit were presented to Destination Bloomington and the Caledonia Area Convention and Tourism Bureau. As the state's tourism office, Explore Minnesota Tourism pursues an entrepreneurial approach, leveraging the state's tourism investment with increased involvement by the private sector. A council of representatives from the state's tourism industry strongly connects Explore Minnesota Tourism with tourism businesses and organizations. Tourism is an $11 billion industry in Minnesota, a key sector of the state’s economy. The leisure and hospitality industry, a major provider of tourism services, employs more than 243,000 Minnesotans. Cautious optimism sums up the mood of Brainerd Lakes Chamber members as the new year unfolds. The 2010 Brainerd Lakes Chamber Fall Policy Survey revealed that 70 percent of respondents enjoyed business performance in 2010 that equaled or surpassed their performance in 2009. Less than a quarter of respondents, or 24 percent, said business was worse in 2010 when compared to 2009. Four out of every five respondents – or 81 percent – said they expected net revenue in 2010 to be at least the same, or even improved, over 2009. The significant changes businesses have made to reduce their operating expenses contributed to these more positive projections. Business owners and managers are carrying this optimistic outlook forward. About three-fifths of respondents – or 59 percent – said they are more optimistic, while 31 percent are unsure and 10 percent are less optimistic, about the 2011 Brainerd Lakes Area economy. Respondents, as part of the survey, expressed a clear message to state legislators – cut government spending and redesign services, which are measures business owners and managers have implemented in recent years. In response to the question what does Minnesota need to do to balance the state budget, 78 percent of respondents said cut government spending, 76 percent said redesign government services and 26 percent said raise taxes. Respondents were allowed to select all that apply. As a result, respondents were allowed to select raising taxes in cooperation with cutting government spending and/or redesigning services. The cost of employee health insurance continues to be a concern. The majority of respondents, 65 percent, said it is a problem, of which nearly 40 percent said it is a severe problem. Only 50 percent of respondents said they offer employer subsidized health insurance for employees. Even with the high unemployment in the Brainerd Lakes Area, 69 percent of respondents said finding/hiring qualified, trained workers is a problem while 65 percent said finding/hiring reliable workers is a problem. Respondents, who could rate the problem from slight to severe, said these are mostly slight problems. The survey was e-mailed to 890 of the primary representatives – owners and managers --- of Brainerd Lakes Chamber members. Completed surveys were received, in November and December, from 162 people – a response rate of about 18 percent – representing a wide cross-section of Chamber business members. The response rate represents a 95 percent confidence level, plus or minus 4.2 percent. How would you improve the business climate in Minnesota? How would you answer this question? Rep. Joe Hoppe, R-Chaska, chair of the Minnesota Commerce and Regulatory Reform Committee, will be the guest during a Brainerd Lakes Chamber listening session at 1 p.m. Jan. 21 at the Northland Arboretum, 14250 Conservation Drive, Baxter. In addition to serving as the chair of what was previously known as the Commerce and Labor Committee, Hoppe will serve as one of the House’s new assistant majority leaders. He wants to know how state government is impacting your businesses. The roundtable discussion will provide business owners and managers with an opportunity to speak freely and openly with the committee chairman about what state government can and should do to improve the business climate in Minnesota. commerce committee. That is why it is important when a House assistant majority leader offers to listen that our community business leaders are willing to be heard. Come join us January 21 at the Northland Arboretum! To register for this free event, visit explorebrainerdlakes.com or call (218) 829-2838.